This week we will publish the interviews I did at Caribana Festival in Nyon back in June with Blood Red Shoes, Polar Circles, Kodaline, Bastian Baker and Jan Oliver. Stay tuned! The first interview I did at Caribana Festival was with Steven Ansell of Blood Red Shoes on 4 June 2014. I went to the backstage and we sat on a couch one next to the other. A friendly lad, down to earth and not at all boasting his popularity, he agreed to have a chat with me despite being jet-lagged. 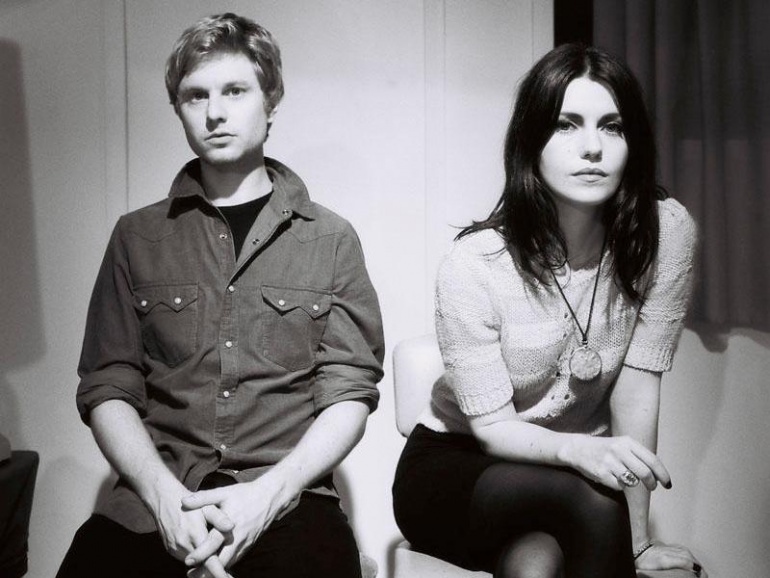 The other half of Blood Red Shoes, Laura-Mary Carter was absent since she had to recover from the jet-lag in order to be in perfect shape for the concert so she was excused. Thanks to Steven for the nice chat, it was very much appreciated and thank you to the Caribana Festival crew and Musik Vertrieb for arranging the interview 🙂 You can check out the concert review here. The Liberation: Your last album is self-titled Blood Red Shoes. Why did you choose this title? Is it because it reflects your music the best? Steven Ansell: Yes it was pretty much that. I guess there are two main reasons. The first one is because we self-produced it, we hadn’t done that before. So in that sense it’s very pure, it’s completely made by us, there’s no engineer, there’s no producer. All the great things and flaws about it are totally about us and not anybody else, so it kind of made sense to call it Blood Red Shoes. We felt like it expressed the kind of artistic idea we’ve had the all time. Which is we really like to write like basically pop songs, catchy melodies and choruses that we feel everybody can sing along to a festival, then we like to ruin it, make it really distorted, or play it too fast and make the lyrics really depressing so that the song is almost at war with itself, we felt we did this a lot in this album. All the songs are pop songs but very distorted and moody, and that’s what Blood Red Shoes does up to this point. I’ve always hated it when bands release their first album and they call it their name, you know. I always think that’s stupid cuz you’re basically saying like “Hi, we’re a new band and this is us.”, how do you know who you are when you start? It takes you a while. We’ve been a band 10 years and now we feel like going “OK, this is really us!” it felt like the right time to make that statement we’ve grown up enough to be confident and have a personality now and say this is really who we are. It seemed like the right time. The Liberation: You said it is your best album so far, in which way? Steven Ansell: Definitely. Like the reasons I just said, I feel like essentially our four albums are different but the difference is small pop songs kind of fucked up, much like The Pixies, they have pop song which are twisted and weird. We haven’t essentially changed that much we have been tweaking our sound and changing and exploring things. In this album I feel like we managed to do all of it, the sad songs the atmospheric songs are better than the one we did before. But also the punk rock ones are more aggressive and more punk rock than the one we’ve done before. We kinda did all the things better you know. Then the next record we don’t wanna do that again, we wanna do something really different we just don’t know what (laughs). The Liberation: So you’re not thinking about the next record yet? Steven Ansell: We are thinking about it but we don’t plan things, we don’t talk about it. We don’t discuss, we play. We make every decision by playing and see what happens and then following a path which leads to the actual music. We know we want to do something different we don’t know exactly what that is with the next record (laughs). We’ve got to spend some time playing and figure it out. The Liberation: How does it feel to play this album live? Steven Ansell: This album is really good live, the third album (In Time To Voices) was difficult live, there were a lot of songs we couldn’t do, it was a really layered studio album. We wanted to make more of a studio album because we had never done it, it meant that some of the songs we literally could not play them live and some other were difficult, which makes it awkward live cuz you’re really concentrating a lot on playing and not on getting anyone excited. This album works so well on stage we are playing a lot of the songs live and for us they’re really straightforward to play cuz we wrote it really live. So for the live set it’s been the best one to play, and everybody going nuts as well, it’s really cool. The Liberation: I’m looking forward to hear it and see it! Steven Ansell: Yeah, it’s cool. I like the set with the new songs it’s really good. And it meant that we could stop playing some old songs that we were getting bored of, which is really important because you can’t have songs that you don’t wanna play anymore, it’s not right. The Liberation: How did the choice of Berlin as a recording place affect your work? Steven Ansell: A few ways, firstly the actual sounds, some of the toughness of this album cuz I think it’s definitely our hardest sounding record, our heaviest record. It’s because to record it we didn’t use an actual studio but an old industrial space, it’s just a big concrete room and you can hear that in the recording. The actual acoustic space sounds really tough and I think that affected the sound of the record. Cuz it’s not a really nice and expensive studio, so it doesn’t sound nice and expensive it sounds kind of harsh and hard, a bit echo-y at times, that affected. You can’t get spaces like that everywhere, that’s a Kreuzberg thing isn’t it? And also I think it’s just the attitude in Berlin, it’s very free … It’s a party city for one thing, but also people are free about everything, they think everything is possible, there’s a sense of adventure and people’s willingness to try things and do things that I think it’s really inspiring and I think this affected our songs. There’s a lot of songs that for us are much more positive, usually our lyrics are really negative. There’s themes in the album that are much more about exploring life and appreciating life and enjoying thinks and about a sense of possibility and I think that was partly because Berlin’s got an optimism to it actually for a city that you always think as a moody and dark city there’s quite an optimism to it. And this album is more optimistic than any other. The Liberation: Do you come up with the lyrics or with the music first? Steven Ansell: The music is always first. The only time there are lyrics that might be written is that Laura and I keep notebooks, and we write little fragments of words and sometimes when we’ve got a song, and by song I mean the music, usually we have the music, then we have the melody with no words, we do this a lot we just sing “na na na na”, which is like nonsense to find the right melody. Once you find the melody then you’ve got to find words that suit the feeling of the melody. So the music always dictates the lyrics. Sometimes we keep notebooks and look through “Oh that would work really well” and there will be like one sentence then you build on that. But the music always comes first every time. I don’t think we’ve ever written a song where the lyrics came before the music. We’ve written songs were the vocals were first, but the vocal melody, without any words again. It’s funny I don’t know why we always do that. In fact the first show we ever played we had not lyrics. We played three songs we sung but without words, “na na na na” it was really stupid (laughs) I don’t know why we did it but it just seemed right at the time (laughs). The Liberation: Was it in Brighton? Steven Ansell: Yeah, that was nearly ten years ago. We just did it, it just felt right. That’s how it always worked. The melodies are really important to us and then the lyrics have to fit the melodies. This Summer The Liberation-Indie Nation sent me to loads of Swiss music festivals to see concerts, interview bands and write reviews. I had a blast! Here’s the interview I did with Steven Ansell of Blood Red Shoes, check it in full on The Liberation. ← CONCERT REVIEW // Bonaparte // Les Docks, Lausanne, 25.10.2014 – Do you want to party with the Bonaparte on a mountain top in Switzerland?